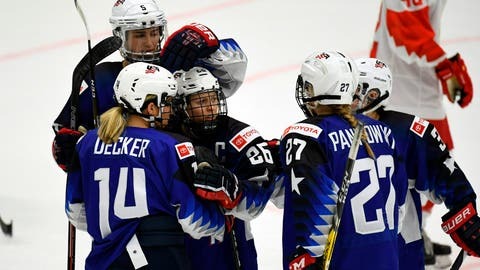 ESPOO, Finland (AP) — Kendall Coyne Schofield and Lee Stecklein scored two goals each, and the United States routed Russia 10-0 Tuesday in the final game of the preliminary round at the women’s world championship. Canada beat Finland 6-1 to finish second in Group A with both teams 2-1-0. Loren Gabel scored two goals and had an assist as the Canadians chased goalie Noora Raty after Gabel’s second goal at 15:35 of the second. Raty gave up three goals on 30 shots. Canadian goalie Shannon Szabados made 22 saves to improve to 17-0 all-time against Finland.